Fast, Easy and Safe. Enjoy Streak-free Cleaning with Only Water! Stuff Points: Earn 2 points when you buy this stuff. Some people call this one a miracle cloth. We just call it the multipurpose cloth because you can use it wet or dry and on virtually any surface. It certainly has the ability to produce miraculous results no matter what you are cleaning though. 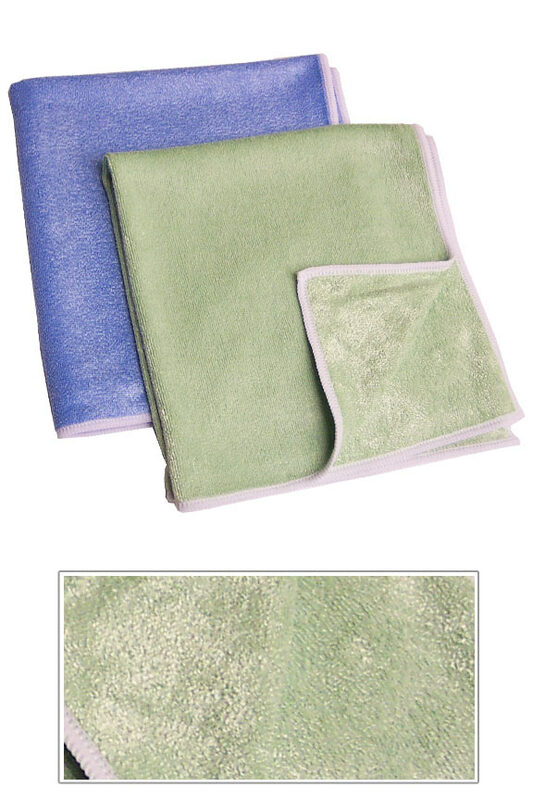 Our multipupose microfiber cloth works so well, you only need water to clean with it. Your favorite non-bleach cleaner can be used if you want to, but water alone will remove 99% of all dirt, dust, germs and bacteria from any surface in your home, office or vehicle. This revolutionary cloth works on almost any surface and is made of the highest quality material available. The unique weave of the fibers allow them to trap grease, grime, dust and micro particles better than any other cloth available. Your counters, dishes, shelves, tables, windows, mirrors and more will be left clean, streak-free and polished with ease. Remove far more dirt than traditional rags, and do it without chemicals. It locks dirt in the fibers and there is never a residue or any lint left behind ever. Use it dry for dusting and polishing or damp for cleaning. Get a streak-free shine with only water as a detergent. Stop using harsh chemicals to clean your home. Microfiber cloths have been widely used throughout Europe for years, and are used by large institutions such as hospitals, hotels, and professional cleaning companies, as well as by small businesses and households. They are the environmentally-friendly choice for cleaning worldwide. Replace your spray cleaners, rags, sponges and paper towels. Make cleaning quick and easy. They are totally reusable and machine washable, hundreds of times. Our multipurpose cloths can be used wet or dry and are great for a variety of cleaning jobs. Don't be fooled by imitations, or knock-off products. These are the best available. Made using the highest quality materials and processes, these cloths clean and polish like no other. They are made from a revolutionary thread, comprised of wedge-shaped polyester filaments with a core of nylon. They are not treated with any chemicals and you don't need to use any additional cleansers when you clean. It's the unique design of the material that makes them clean so well. The fiber's wedge shaped filaments follow surfaces, lifting up dirt, and then trapping the particles inside the fibers. Our multipurpose microfiber cloth will eliminate your need for harmful cleansers, as it removes 98-99% of all dirt, bacteria, and grime without any kind of chemical spray. The capillary effect between the filaments and nylon core creates a high absorbency, which in turn enables this cloth to clean and polish at the same time. Safe for the most delicate surfaces, our multipurpose cloth will never harm anything you use it on. Only water is needed as a detergent to clean any type of surface. Mix and match with our other 16" microfiber cloths to recieve discounted pricing when you buy more than one in a single order. Dimensions (l x w) 16" x 16"
Microfiber Miracle Cloth - Multipurpose cloth that works with water alone for cleaning, or dry for dusting and polishing. Machine washable hundreds of times. These microfiber clothes are much better quality than what I am able to find in retail stores. Saturated with water, they clean dried bugs off the car bumper. These are great cleaning cloths for everything!! They are different from the ones I bought, and you can tell a big difference in the material. Don’t have to use chemicals to clean, but I do purchase distilled water to spray on cloths to clean!! I have bought 6 to try them out, and recently purchased 12 more, and planning to buy more. '17 Oct 27 I use it for mirrors and glass around the house. So far, so good after 1 month. I have used other highly recommended micro fiber clothes from reputable companies BUT I must say the quality of these cloths have cut down my work time and compelled me to tell others how good they are!!! By far, these are the best quality! I don't write many reviews b/c I either don't have time or the produce isn't screaming at my. This us an exception!!! ?????? Love these. Having used microfiber clothes to clean with for several years it is obvious there are good and not so good microfiber clothes. These are among the best I have purchased. Very happy with this item and highly recommend them. Would definitely purchase them again. These cloths work well and wash well - good quality and great price! I will order more of these from this site when I need them. excellent for polishing furniture and other stuff that needs to shine. Love the micro cloths. Picks up everything and I don't have to use harsh chemical anymore. No more wasting duster refills. These cloths are so universal and work great! I use them dry to dust. I use them wet to clean my mirrors, stainless steel appliances, and anything in the bathroom to anything in the kitchen. These clothes don't show streaks! I love that all you have to use is water, no chemicals! They're a great price and actually save you money because you don't have to buy all the cleaning solutions. These microfiber clothes are much better quality than what I am able to find in retail stores. Saturated with water, they clean dried bugs off the car bumper. Easily. We stopped using chemicals in our home for cleaning 4 years ago and had been using a different brand of microfiber rags (Norwex). I needed to replace those but the price had gone way up so I researched and ran across these and thought it was well worth the price to give them a try and I found them to be far superior at a lower cost. They are larger and the microfiber stays much softer. Absolutely love them, I even ordered some for my Mom. Will miracle cloths clean bathrooms without chemicals? None. The advanced material does all of the cleaning without any harsh or dangerous additives. 0 of 1 Customer(s) found this Answer helpful. We love them for cleaning all over the house, but now most of ours don't come clean in the wash. The lint and/or dust seems to stick to them so they get surfaces dirty again when we use them. Do we just need to get new ones, or is there a way to get them clean again? Thanks. Try washing with hot water first to see if that resolves the problem. If you've had the cloths for several years, it may be time for replacement. Where are these made? Is there a tag on them? This cloth is made in China. What is the best way to wash these cloths so you won't have leftover laundry detergent in them that could potentially cause streaking when cleaning glass?? Should I use something like Woolite?? You can, but most people find regular detergent works just fine. If you are concerned, you can wash with hot water. The heat will open up the fibers to allow the material to rinse clean more efficiently. What is this cloth made of? What size are the individual fibres? The Best Natural Cleaner in a Convenient Measure and Pour Bottle. Extra Wide And Super Sticky. A Reusable Hair and Lint Removal Tool! A Money Saving Package. Get 2 or 3 Products For One Low Price. A Money Saving Combo Pack. Mopping Made Easy! Powerful And Biodegradable. A Safe And Effective Way To Clean The Dirtiest Hands. High Quality Microfiber. Specially Designed for Phones And Other Electronics. A Powerful Tool. Use Right On Your Pet, Or Use To Clean Up The Fur They Drop. Made from natural rubber and featuring four different surfaces. Eliminate unsightly fuzz and fluff when on the go.